You can now purchase a cable that lets you directly connect a Surface Pro or Surface Laptop to a USB-C battery or wall adapter for charging. The J-Go Surface Connect to USB-C Charging cable costs $19.99 and is available to order now. The cable is exactly as its name describes: one end of the six-foot cord has Microsoft’s proprietary Surface Connect adapter, while the other end is a standard USB-C plug. I tested the cable with both a Surface Pro and a Surface Laptop, and I was able to charge both devices using either a USB-C PD battery pack or a USB-C wall charger. J-Go rates the cable at 15V and says it will work with most USB-C power delivery (PD) devices, including portable batteries. If you’re using a Surface Go, the battery or wall charger needs to output at least 29W (though if you’re using a Go, you don’t really need this cable as it already has a USB-C port built-in). The Surface Pro and Surface Laptop demand at least 36W. The company says that best performance is found with 45W or 60W adapters. This cable is technically not as versatile as Microsoft’s adapter since it doesn’t support data transfer or video output; it’s solely used for charging. J-Go’s founder Jay Terry tells me that the company is in the process of developing a product that can support those functions, but he doesn’t know when that might come to market. 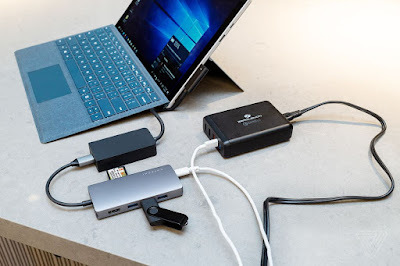 Even with those limitations, the Surface Connect to USB-C Charging cable makes it easy for Surface device owners to charge their laptops with the same power brick they might use for their phones or use a portable battery pack to juice up on the go. Until Microsoft fully adopts USB-C across its devices, this is the next best thing.